Status: Rare casual spring migrant west. Rare regular fall migrant west, rare casual eslewhere. Documentation: Specimen: UNSM ZM6310, 13 Sep 1919 Monroe Canyon, Sioux Co (Mickel and Dawson 1920). Taxonomy: No subspecies are recognized (Pyle 1997). This species was treated as a subspecies of Yellow-bellied Sapsucker (AOU 1957) until recently; it is now considered a full species (Johnson and Zink 1983, Walters et al 2014). 4 Jun 2014 near East Ash Road, Dawes Co (Jeff Birek, eBird.org). One in Hall Co 5 Mar 2007 was well-described, with no apparent hybrid characters, an early and easterly report for this species; it may have been a variant Yellow-bellied Sapsucker or an intergrade. A report of one at Sidney, Cheyenne Co 12 Mar 2016 was not accepted by NOURC for lack of detail (Brogie 2017). Almost all of the records are in mid-late Sep. There are later sightings 13 Oct 2006 and 16 Oct 2005 at Wind Springs Ranch, Sioux Co; easterly and late was one at Lake Ogallala, Keith Co 26 Oct and 2 Nov 2000 (Jorgensen 2002), the only accepted record east of the Panhandle until an extraordinary record of one in Brown Co 15-16 Sep 2018 seen by many NOU members and well-photographed. At least one Red-naped Sapsucker is found each fall at Wind Springs Ranch, Sioux Co (Helen Hughson, personal communication) as might be expected since there are breeding populations in the Black Hills of South Dakota (Peterson 1993, Tallman et al 2002) and Wyoming (Faulkner 2010). 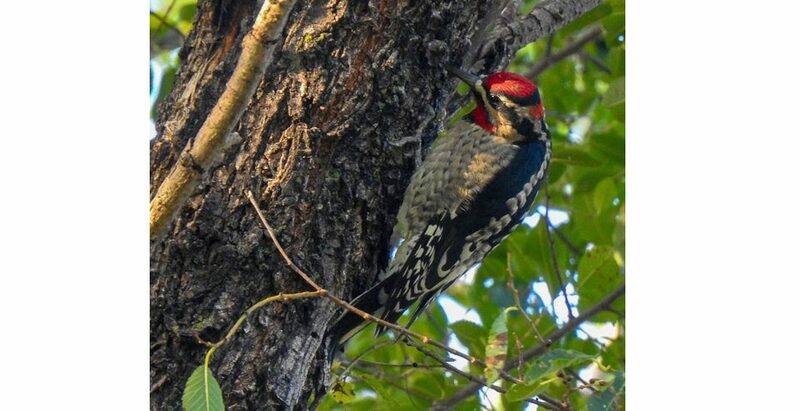 It is likely that some of the earlier sapsucker reports from the Panhandle prior to elevation of this taxon to species status are of this species, especially in fall, when the two species can be difficult to distinguish (Kaufman 2011). Reports likely to be of Red-naped Sapsuckers are 22 Sep 1990 Sioux Co, 23 Sep 1979 Dawes Co (Rosche 1982), 26 Sep 1982 Scotts Bluff Co, 28 Sep 1991 Sioux Co, 30 Sep and 1 Oct 1989 Scotts Bluff Co, and 2 Oct 1976 Scotts Bluff Co. In fall, most Red-naped Sapsuckers depart before the arrival in the west of Yellow-bellied Sapsuckers; It is useful to remember, especially in the west, that juvenile-plumaged birds seen after Aug are Yellow-bellieds, as Red-naped juveniles molt into adult plumage in Aug, prior to migration (Kaufman 1990, Walters et al 2014). Comments: A specimen, UNSM ZM6312, collected at Chadron 23 Sep 1919 (Mickel and Dawson 1920) is a juvenile male, but its identity to species is difficult to determine. This specimen, we believe, is most likely a juvenile Yellow-bellied Sapsucker. At that date, most Red-naped Sapsuckers should show significant adult features (Kingery 1994), but this specimen shows only scattered red feathers in the throat and crown but not on the nape, in contrast with the juvenile male Red-naped Sapsucker cited above, UNSM ZM6310. Photograph (top) of a Red-naped Sapsucker at Plum Valley Wildlife Management Area, Brown Co, 15 Sep 2018 by Rachel Hall. Brogie, M.A., and E.M. Brogie. 1987. A Red-naped Sapsucker in Sioux County, Nebraska. NBR 55: 40. Johnson, N.K., and R.M. Zink. 1983. Speciation in sapsuckers (Sphyrapicus): I. Genetic differentiation. Auk 100: 871-884. Kaufman, K. 1990. A field guide to advanced birding. Houghton Mifflin Harcourt, Boston, Massachusetts, USA. Kaufman, K. 2011. Field Guide to Advanced Birding. Houghton Mifflin Harcourt, Boston, Massachusetts, USA.